Let’s be honest here for a second: A workout is not just a workout. Just like “calories in, calories out” is completely false, the workouts you do can make or break what you are trying to achieve. They are NOT created equal. Far too many people think that just because they went to the gym and did something, this constitutes a good workout. However, I hope you would agree that just because you showed up at the gym and sweated a bit, this doesn’t mean you got in a good workout. Don’t think that all workouts will produce the same results because they certainly won’t. I cannot stress enough the importance of doing the proper workouts and exercises. I mean, what is the point of losing 10 pounds if it all comes from muscle? In other words, if you don’t have muscle, you will not appear to be toned, lean, and fit. Our bodies were meant to have muscle. Muscle is needed in everyday life. The stronger you can get, the better. Now don’t think that I want you to look like the Hulk. That is not at all what I am saying. What I mean is that if you train to strengthen your body and muscles, you will naturally lean out and have a defined muscular physique. Don’t fall into the trap of “oh I am going to get bulky from lifting.” Not one bit true. One of the most common workouts you see at the gym, people spending hours on cardio equipment. This is a recipe for disaster as it not only puts a lot of stress on your body but it also eats away at your hard earned muscle. 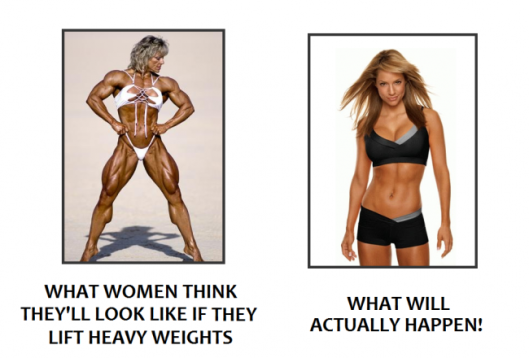 So although you may lose a few pounds, all that weight is coming from muscle, not fat! Sprints on the other hand are the most powerful physique shaping workout on the planet. Not only do they directly target fat burning, but they promote lean muscle growth. Truly and win-win situation. For some great sprinting workout options (even ones that can be done on a treadmill), check this out! If you want to start cutting the flab and replacing it with lean muscle, start sprinting 2-3 times per week and cut out the 60-minute long cardio sessions! 2. Free weights over machines! We took on this debate the other day, but free weights are far superior to machines. They activate more muscles which in turn means you will burn more fat and build more lean muscle. If you want your results to double, step off the machines and pick up the free weights. To see our full debate, check out Free Weights Vs Machines! 3. Using weight that is far too light. “If you want to get lean, you must train mean.” Do not be afraid to pick up a weight that is challenging (of course putting safety first!). Too many times you see people in the gym doing 12 reps of an exercise with a weight that they can do 25 reps with. This is not doing anything for you. If you want to build strength, you have got to challenge your muscles and body each time you go to the gym. Focus on using a weight that you will only have 1-2 reps left in the tank. For example, if you are going to do 10 reps of an exercise, you should choose a weight that you could not do 12 times. If you can do 15 reps on a 10 rep exercise, the weight is too light. >> Don’t Be Afraid To Get Strong! 4. Doing too many reps.
Don’t fall into the trap of thinking you have to do thousands of reps to get lean and toned. Instead, focus on challenging yourself and doing anywhere from 5-15 reps and 3-5 sets on each lifting exercise. For bodyweight workouts, do a rep amount that will challenge you. For example, doing 3 sets of 50 push-ups will challenge some while for others 3 sets of 10 will do the trick. The key here is to be constantly pushing to add more weight to your lifts and more reps to your bodyweight exercises. 5. High intensity over low intensity. We have discussed this multiple times in the past, but when it comes to getting fit, high intensity is king. The higher the intensity your workouts, the better results you will see. Whether this be from sprinting, lifting heavy, doing a high intensity interval circuit, etc. Focus on bumping up the intensity on every workout you do! For cardio purposes, do sprints at least 2-3 times per week and walk daily (preferably outside). Cut out the long slow cardio! Do free weight and bodyweight exercises. Stay off the machines. Challenge yourself in your workouts by using a challenging weight with the proper repetition number. If you start incorporating those four bullets into your workouts, not only will you start burning fat faster than ever, but you will get the lean, toned body you have always wanted! Click HERE For the Complete Home Workout Revolution program for just $9!